in art, any method employed to represent three-dimensional space on a flat surface or in relief sculpture. Although many periods in art showed some progressive diminution of objects seen in depth, linear perspective, in the modern sense, was probably first formulated in 15th-century Florence by the architects Brunelleschi and Alberti. Brunelleschi designed (c.1420) two panels depicting architectural views of Florence, in which he constructed a mathematically proportioned system of perspective. Alberti, in his De pittura (1435), harnessed the technique of perspective to the theory that painting is an imitation of reality. He viewed the picture plane as a window through which one looks at the visible world. Objects in the picture were to be systematically foreshortened as they receded into the distance. Orthogonal lines converged to a single vanishing point, which was to correspond to the fixed viewpoint of the spectator. Reflecting the growth of humanism, the spectator played a new role in art, as man was to determine the measurement of all things. The Italian artists who experimented with perspective, including Donatello, Masaccio, Uccello, and Piero della Francesca, sometimes diverged from the rules for a greater artistic effect. In general, however, the 15th-century Italian artists tended to work within a geometrical system, whereas the contemporary Flemish painters used more empirical means to achieve a convincing delineation of space. The technique of linear perspective had an immense influence on the development of Western art. In the 20th cent., however, its use has considerably declined, since many artists have rebelled against the conception of art as a mirror image of reality. Aerial or atmospheric perspective was developed primarily by Leonardo da Vinci. In general, it is based on the perception that contrasts of color and of light and dark appear greater, and contours more defined, in near objects than in far. Aerial perspective takes note of the recessive character of cool colors and the prominence of warm colors. In East Asian art, perspective effects were achieved by the atmospheric method, often incorporating zones of mist to separate near and far space. See R. V. Cole, Perspective for Artists (1976); J. Cody, Atlas of Foreshortening (1984); M. Kubovy, The Psychology of Perspective and Renaissance Art (1988). a system for the representation of three-dimensional objects on a plane or other surface while taking into account the objects’ spatial structure and the distances of the objects’ various parts from the observer. The concept of perspective arose in connection with the development of optics and various art forms, especially painting. Prehistoric man and the artists of the ancient East devised a number of techniques for rendering the relative positions of objects—for example, tiered composition and the contrasting combination of front and side views. They subordinated the objects to an arbitrary symbolic scheme rather than to a single viewer-related scale. A tendency to unify space by means of perspective appeared in ancient Greek art in the sixth century B.C. 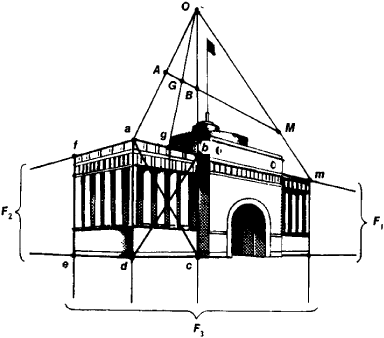 Rules of perspective were first mentioned in the Greek mathematician Euclid’s treatise Optics (third century B.C.). The Roman architect Vitruvius ascribed the practical application of perspective in theatrical scenery to the time of Aeschylus (sixth and fifth centuries B.C. ), and he also mentioned treatises, now lost, on perspective by Anaxagoras and Democritus. Examples of classical perspective painting are the frescoes of the Second Pompeian Style (c. 80 B.C. to c. A.D. 30). These frescoes have constructions with nearly central perspective—that is, one center of projection. Axial (“herringbone”) perspective was also widely used in antiquity; it implied several vanishing points situated on a vertical axis. Late classical and medieval art does not display a concern with a systematic treatment of perspective as a whole. Frequent use, however, was made of inverted perspective, which involved the enlargement of individual objects with distance and the synthesis of several viewpoints. A consistent, mathematically grounded perspective system designed for a fixed, anthropocentric viewpoint appeared in the Italian quattrocento; important here were F. Brunelleschi, L. B. Alberti, Masaccio, Piero della Francesca, and Paolo Uccello. The northern European masters—the brothers H. van Eyck and J. van Eyck and A. Dürer—also made a significant contribution to the practical and theoretical development of perspective. Leonardo da Vinci provided substantiation for the principles of aerial perspective—he investigated the atmosphere’s effect on the sharpness of outline of objects and on the color of objects at different distances. The optical-mathematical approach to the problems of perspective was unknown to Oriental art. A number of empirical systems, however, were developed. An example is the parallel perspective typical of Chinese and Japanese painting; it can be regarded as a construction with an infinitely distant center of projection. From the standpoint of geometry, perspective is a method of representing figures through the use of central projection. To obtain a perspective representation of an object, rays are extended from a chosen point in space (the center of perspective) to all the points of the object. The surface on which the representation is desired is placed in the path of the rays. The desired representation is obtained at the intersection of the rays and the surface. The perspective representation of an object on a plane is referred to as linear perspective; on the interior of a cylinder, as panoramic perspective; and on the interior of a sphere, as spherical perspective. Perspective representations of parallel lines intersect at vanishing points, and of parallel planes at vanishing lines. The general method for constructing the perspectives of complex objects whose orthogonal projections are given on a vertical (see Figure 1) or inclined plane is based on projective geometry’s theorem of the correspondence of four points. Two mutually perpendicular planes are chosen on the object, and a rectangle is drawn in each plane. The perspectives of these rectangles are then constructed by making use of the laws of descriptive geometry. In Figure 1, the perspectives of the corresponding rectangles of the object are indicated by abed and adef. The points F1, F2 and F3 —the points of intersection of the extensions of the rectangles’ sides—are the vanishing points; F3 is an infinitely distant point. Lines are drawn between the points of intersection of the constructed rectangles’ diagonals and the vanishing points. The perspective of the midpoints of the rectangles’ sides is found at the intersection of these lines and the sides. In Figure 1, point g is the perspective of the midpoint G of side AB. To construct the perspectives of other points of the object, such as the point M on the line AB, an arbitrary point O is chosen and rays Oa, Ob, and Og are extended from it. Points A, B, G, and M are transferred from the orthogonal drawing to a separate strip of paper, and this paper is placed on the drawing in such a way that A, B, and G are on the rays Oa, Ob, and Og. The perspective (point m) of point M is obtained by projecting M on the line ab along the ray from O. Perspectives on an inclined plane are constructed in an analogous way. Of great importance in the theory of linear perspective is the study of the distortions that arise in the peripheral parts of a picture as a result of the considerable deviations of the projected rays from a position perpendicular to the plane in which the representation is constructed. Rynin, N. A. Nachertatel’naia geometriia: Perspektiva. Petrograd, 1918. Glagolev, N. A. Nachertatel’naia geometriia, 3rd ed. Moscow, 1953. Baryshnikov, A. P. Perspektiva, 4th ed. Moscow, 1955. Kuznetsov, N. S. Nachertatel’naia geometriia. Moscow, 1969. Panofsky, E. “Die Perspektive als ‘symbolische Form.’” In Vorträge der Bibliothek Warburg, 1924-25. Leipzig-Berlin, 1927. Pages 258-330. Gioseffi, D. Perspectiva artificialis.… [Trieste] 1957. White, J. Birth and Rebirth of Pictorial Space, 2nd ed. London, 1967. The technique representing a figure or the space relationships of natural objects, on either a plane or curved surface, by means of projecting lines emanating from a single point, which may be infinity. 1. The technique of representing solid objects upon a flat surface. 2. A picture or drawing employing this technique. Each technique begins with sketching, which addresses the concept of seen perspective in any given setting. In other words, although some researchers have adopted an agentic perspective of Teacher Efficacy conceptually, it has been lost in the operationalization or measurement of the construct. Dual-career partners; women; men; adolescents; diverse populations that include race and ethnicity, gay men, lesbians, and bisexual and transgender persons; and persons with disabilities will benefit from the life roles perspective. The anomie perspective explains that the presence of deviance is the result of weakening social structures during the transitions of societies; the natural, cohesive forces that maintain order are destroyed as societies change. And, for agrimarketers digging deep to help clients create competitive advantage, this understanding of the total organization opens up new avenues for driving difference and provides perspective on decision-making processes in a wide variety of food and agribusiness organizations. An ecological perspective allows for a better understanding of student needs and can lead to more effective school counseling programs and interventions. In developing the internal perspective of their strategy map, managers identify the processes that are the most important for their strategies. Two factors stand out in this definition: a perspective and an environment. Bell's negative perspective is apparently the consequence of her own religious skepticism. This is why it may be time for the Toronto International Film Festival to reconsider the form and function of Perspective Canada. Security Cooperation: Perspective Is Everything! The first Pro-Life Perspective aired in January 1985.